Boone Central junior Jade Gottier was one of 10 players receiving 2012-13 Mid-State All-Conference honors in voting by the league’s girls basketball coaches last week. Newman Grove senior Darienne Pokorny was among 15 Mid-State athletes selected All-Conference Honorable Mention. 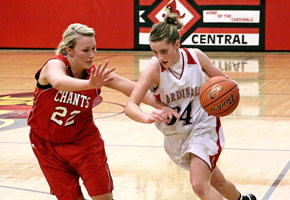 Gottier helped pace Boone Central/Newman Grove to a 13-12 record, leading the Lady Cardinals in a number of statistical areas. Gottier topped the Cards in scoring (13.2 per game), rebounding (6.0), assists (3.4), steals (2.7) and defensive touches (151), while shooting 42 percent on 2-point field goal attempts, 32 percent from 3-point range and 73 percent at the foul line. The junior standout placed her name prominantly on the Boone Central all-time lists with her all-around performance in 2012-13. Her season point total (331) was the second-best Lady Cardinal season all-time and her defensive rebound total (110) tops that season chart. In other single-season areas, Gottier was third-highest in total rebounds (149), third in defensive touches, sixth in steals (67) and sixth in assists (85). On career lists, she now ranks second in defensive touches (379), fourth in points (646), assists (208) and steals (158), fifth in defensive rebounds (198) and ninth in total rebounds (276). 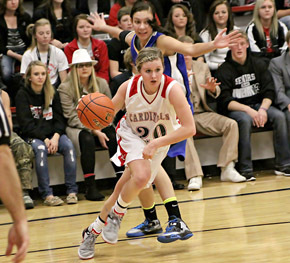 Pokorny, in her first Class C1 season, was also one of the Lady Cardinals’ leaders. The senior guard was second in points (9.2), steals (2.3), assists (1.7) and defensive touches (90) and third in rebounds (4.3). She was one of Boone Central/Newman Grove’s top 3-point shooters (33%) and made 66 percent of her free throws. 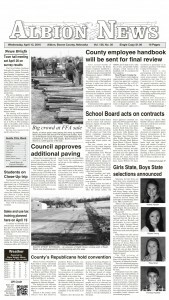 Jade Gottier, Jr., Boone Central/Newman Grove; Allison Arens, So., Crofton; Bridget Arens, Sr., Crofton; Quinn Wragge, So., Crofton; Katelyn Dickes, Sr., Hartington C.C. ; Alayna Daberkow, Sr., Madison; Michaela Barry, Sr., Norfolk Catholic; Amy Miller, Sr., Norfolk Catholic; Rachel Wiedenfeld, Sr., Pierce; Abby Ortmeier, Sr. Guardian Angels C.C.